Total nonfarm payroll employment increased by 175,000 in May, and the unemployment rate was essentially unchanged at 7.6 percent, the U.S. Bureau of Labor Statistics reported today. Employment rose in professional and business services, food services and drinking places, and retail trade. Both the number of unemployed persons, at 11.8 million, and the unemployment rate, at 7.6 percent, were essentially unchanged in May. Among the major worker groups, the unemployment rates for adult men (7.2 percent), adult women (6.5 percent), teenagers (24.5 percent), whites (6.7 percent), blacks (13.5 percent), and Hispanics (9.1 percent) showed little or no change in May. The jobless rate for Asians was 4.3 percent (not seasonally adjusted), little changed from a year earlier. The civilian labor force rose by 420,000 to 155.7 million in May; however, the labor force participation rate was little changed at 63.4 percent. Over the year, the labor force participation rate has declined by 0.4 percentage point. The employment-population ratio was unchanged in May at 58.6 percent and has shown little movement, on net, over the past year. In May, the number of persons employed part time for economic reasons (sometimes referred to as involuntary part-time workers) was unchanged at 7.9 million. These individuals were working part time because their hours had been cut back or because they were unable to find a full-time job. In May, 2.2 million persons were marginally attached to the labor force, down from 2.4 million a year earlier. (These data are not seasonally adjusted.) These individuals were not in the labor force, wanted and were available for work, and had looked for a job sometime in the prior 12 months. They were not counted as unemployed because they had not searched for work in the 4 weeks preceding the survey. Total nonfarm payroll employment increased by 175,000 in May, with gains in professional and business services, food services and drinking places, and retail trade. Over the prior 12 months, employment growth averaged 172,000 per month. Professional and business services added 57,000 jobs in May. Within this industry, employment continued to trend up in temporary help services (+26,000), computer systems design and related services (+6,000), and architectural and engineering services (+5,000). Employment in professional and business services has grown by 589,000 over the past year. Within government, federal government employment declined by 14,000 in May. Over the past 3 months, federal government employment has decreased by 45,000. 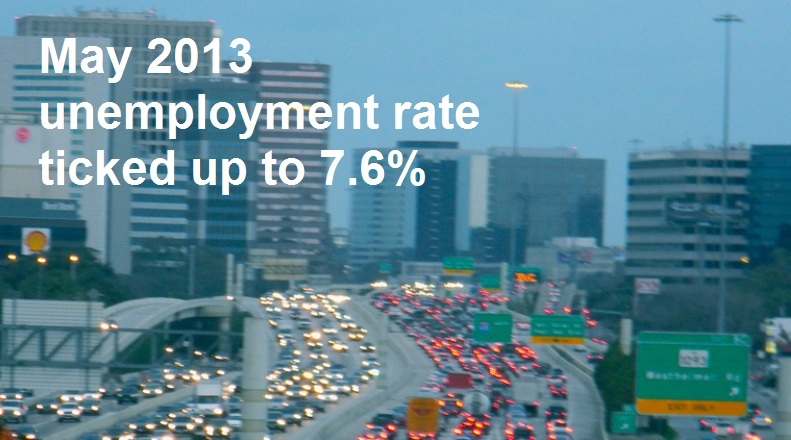 May 2008 the nation’s unemployment rate was 5.5% with a total of 6.9 million unemployed persons. Unemployment rate was the following: whites 4.4% and for blacks 9.2%. May 1994 the nation’s unemployment rate was 6.0% with a total of 7.9 million unemployed persons. May 2000 the nation’s unemployment rate was 4.1% with a total of 5.8 million unemployed persons. Unemployment rate was the following: whites 3.4% and for blacks 8.2%. In September 2000 the unemployment rate was 3.9%. This was the first time the nation’s unemployment rate had been below 4.0% since January 1970. January 2001 the nation’s unemployment rate was 4.2%. The number of unemployed persons rose to 5.95 million. Video: BBC- Why are so many young black men jobless in the United Kingdom?